The first year I went to Burning Man, I didn’t visit the Temple until Thursday. L and I knew we had to make it out there, but for some reason it seemed really far from our home in the 7:30 keyhole, and besides that, every time we left camp we’d get distracted from our mission by, well, everything. 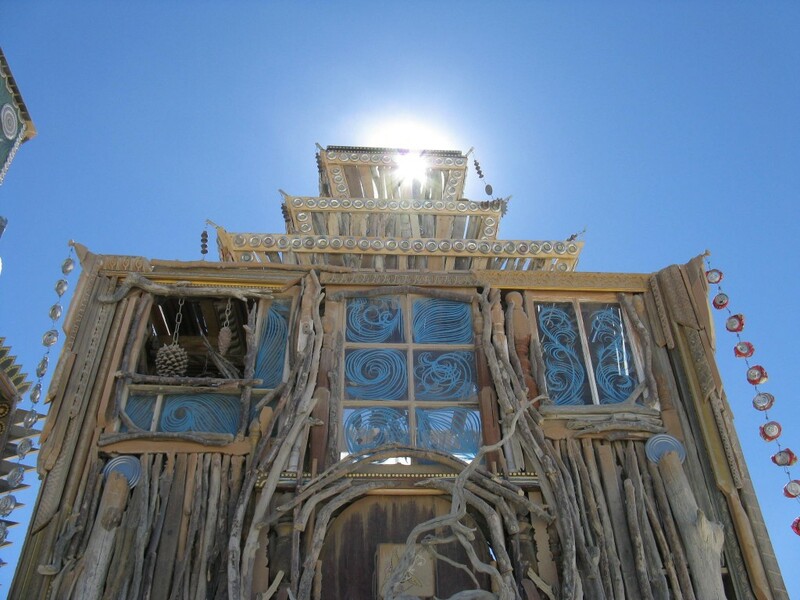 We were also somewhat reluctant to visit the Temple because we’d heard that it was a powerful yet somber place of mourning, which at the time seemed out of sync with the rest of the experiences we were having at Burning Man. We’d been transported to a dusty land where everyone hugged us, half of them poured us a drink, fiery art and performance awed us every night, and giant ducks, bunnies, and dragons ridden by dancing people who were either naked or adorned like tribal shaman on a trip beyond the Thunderdome trundled by our camp on a regular basis. What place did mourning have in all this hedonism? Come Thursday, we finally made the journey. We parked our bikes, grabbed our cameras, and proceeded to approach the Temple with an attitude of curious interest. It was midday, and it was crowded within the hushed shade of the structure. No mutant vehicles blaring their sound systems here, just the music of chimes, made of bottle caps and stained glass, hanging from every outer edge. Here, a woman sobbing in front of a small altar with pictures of a child. 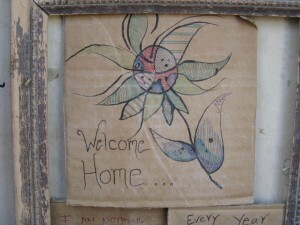 There, on the ground, in an intricately hand-carved and hand-painted box, someone’s ashes. Photographs, mementos, stories, letters, placed in the Temple, nailed to the Temple, and written directly onto every available surface of the Temple. Pairs and singles circumnavigated the structure, talking and weeping quietly, hugging one another, looking for a spare inch on which to etch their pain, leave their respects, or release their deepest secrets. We, witnessing, were drawn in and cradled in the shade of the Temple that day, playing our role as the thousands that came before and would come after, leaving small pieces of our hearts on the Temple walls and taking the pieces of other people’s hearts with us when we left. Sharing. Healing. In my husband’s words, that year at the Temple was the most “intensely human, spiritual experience” he’d ever had in his life. When the shadows were long, we finally pedaled our bikes away from the Temple and back into the writhing, throbbing spectacle that is the rest of Black Rock City. We were silent on our ride, each lost in our own thoughts, brimming with knowing and understanding. Burning Man embraces the full spectrum of emotions, not only the ones we wish to have, but those that we perhaps wish we didn’t. While the vast majority of the event is devoted to unrestricted joy and excess, in order to embody the entirety of the human experience we must also establish a place for our pain and sorrow, betrayal and and loneliness, disappointment and heartbreak. The Temple captures all of these emotions and wraps them in unparallelled beauty. It is a place to go when you need to wallow in feeling, without judgement, until you find release. The Temple transforms private grief into a public rite. Modern death rites have become privatised, shifting the emphasis from the community to the private world of the individual and the family. 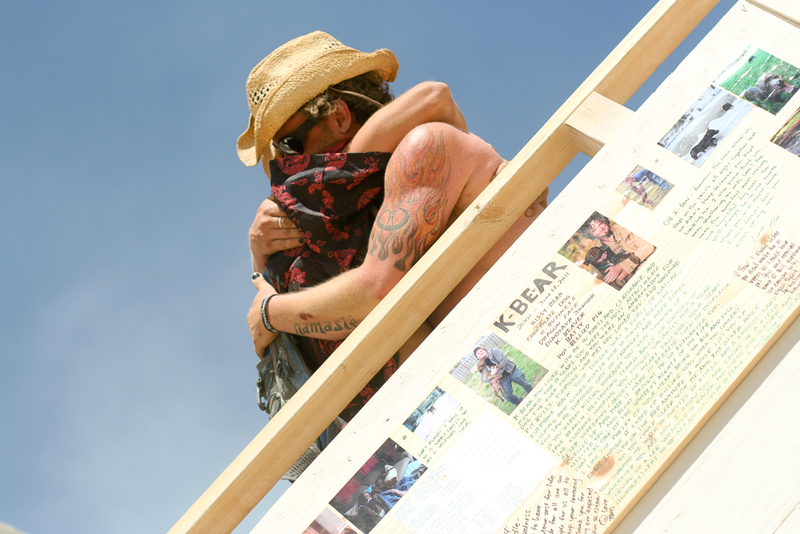 The Temple at Burning Man reverses this process, making grief and mourning public and shared between intimate strangers. Studies by Philippe Ariès, Peter Homans and other scholars suggest that death and loss become more bearable when the burden of mourning is taken on by a community rather than left to the individual. Burners’ testimonies suggest that unmourned grief is overwhelming for those who cannot turn to traditional ways of collectively and publicly mourning the dead. Collective rites of passage around death and grief are designed to allow for the dead to move on and for the living to let the dead go. Most Burners identify themselves as ‘spiritual’ but not religious, and for them the dearth of rituals for grief and mourning is especially difficult. 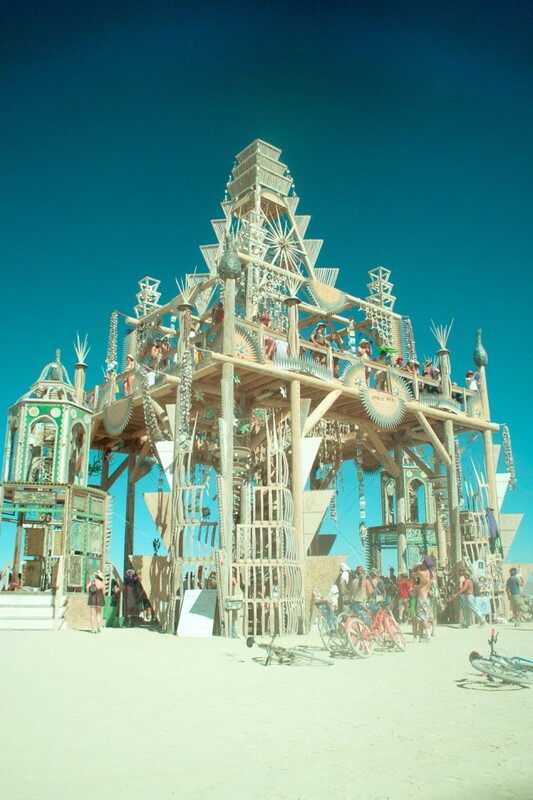 Bill, one of the carpenters who worked on the Temple of Juno, suggested that ‘a lot of these people at Burning Man don’t have a structured religion to help them’. The Temple, he pointed out, provides a place in which they can ‘express their grief and joy’. The Temple is, for some people, a spiritual place. 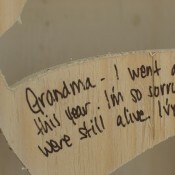 For others it provides a connection to those they’ve lost; a place to memorialize a loved one in a way that may not have been possible at the time of their death. And yet for others, it is a place for reflection and renewal. The Temple acknowledges the full circle of life that all of us will experience as humans, and it does so beautifully, respectfully, and all-inclusively. 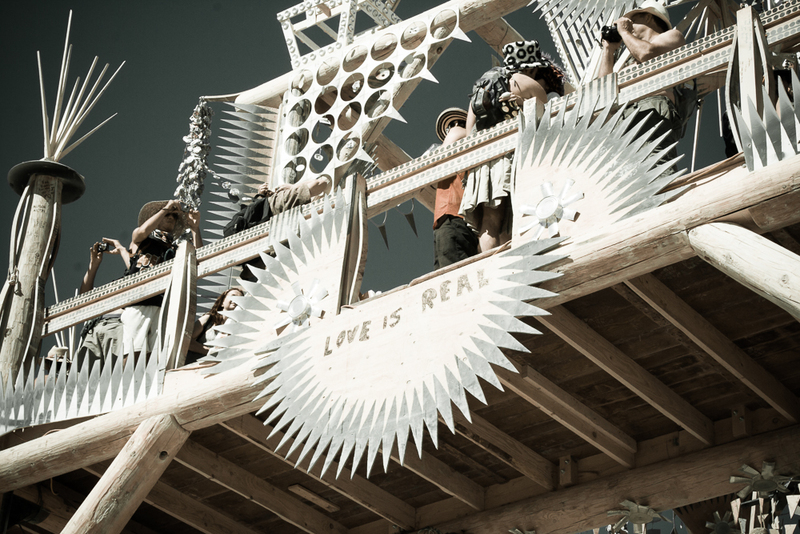 It is an integral part of Burning Man without which the event would simply be just another over-the-top festival. What we give to the Temple, and what we take from the Temple, is both deeply personal and universally needed. My favorite temple thus far was in 2011. That year we stayed with the Rangers at Outpost Berlin, 3:00 and C. It seemed really far to me because I was used to staying over by 7:30, but one gift of being in that location was that it felt closer to the Temple. I found myself out there just about every day, reading, writing, and admiring. The Temple of Transition was phenomenal not just because of the size and scale of the structure, but because it was a monument to the transformational power of sound. The first time I visited it, I was moved to tears when I realized that what I’d thought at first to be people playing music in the innermost part of the Temple turned out to be numerous bells, chimes, and other bright percussive instruments, all chained together and programmed to play out a variety of music depending on the time of day. This Temple was also the home of an earth harp, a beautifully resonant stringed instrument of gigantic proportions. It was truly something to behold. 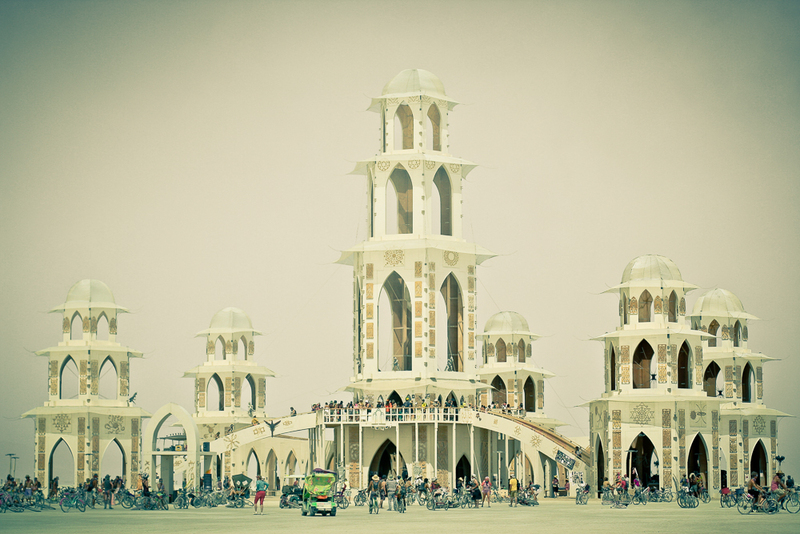 Just like everything else at Burning Man, the Temple changes from year to year, and you get what you want from it. 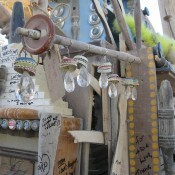 But unlike many experiences you can have at Burning Man, the Temple is not focused on immediacy. Rather, the Temple has more of a far-reaching, cumulative effect. The first year, you get it. The next year, you bring more of yourself to it. Some other year, you might desperately need it. I come to the Temple with a purpose; an expectation that is built upon my knowledge of its intention. It’s where I go to reflect upon what’s happened in my life since I was last there. I celebrate my accomplishments, acknowledge the work I have yet to do, and mourn what I have lost. And when, at the end of the event, the Temple is burned to ashes, I rise again, shake off the ashes, and re-enter the world with clear eyes and new resolve. If you are interested in reading more stories of how the Temple has affected others, please go here. If you are interested in learning more about the Temples, or the Guardians who hold the space of the Temple (I will be one this year), please go here.